Choosing pool liners is an important decision in the process of putting in new pools or replacing pool liners. We have done both. 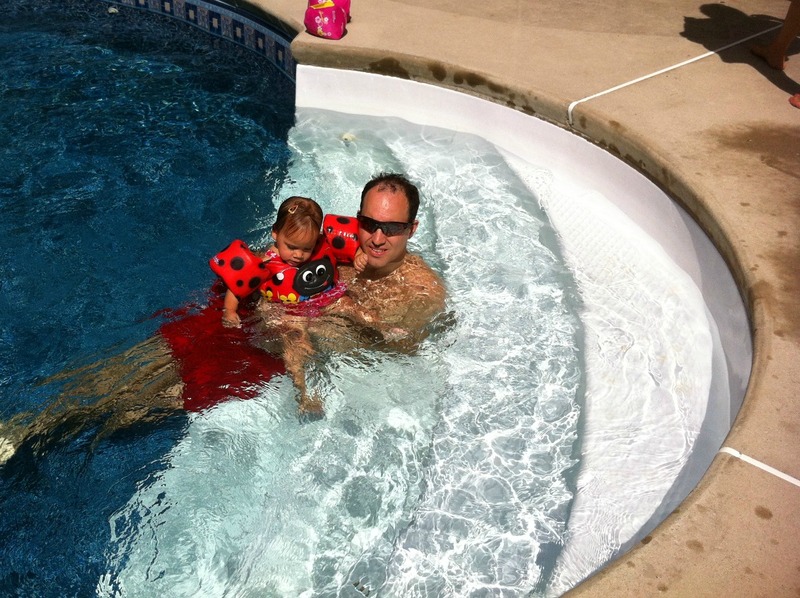 Of course along with selecting a pool liner you are also choosing your installer. Be sure to check several references before you make your final decision. Pool liner thickness is listed as "gauge" or "mil." They are not the same. So be sure you ask which it is. The higher the millage (mil) number the thicker the liner. A 30 mil liner is equivalent to 0.0300 inches. The range in thickness is usually from 20 mil to 30 mil. The 20 mil thickness is generally the least expensive. However we were told by some installers that thicker pool liners do not necessarily last any longer than the industry standard 20 mil vinyl liner. 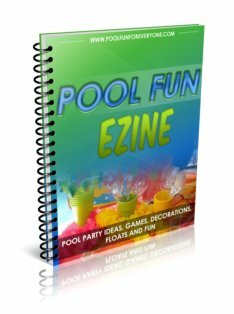 Ask the pool companies if they have any 27 mil liners available at the 20 mil price. 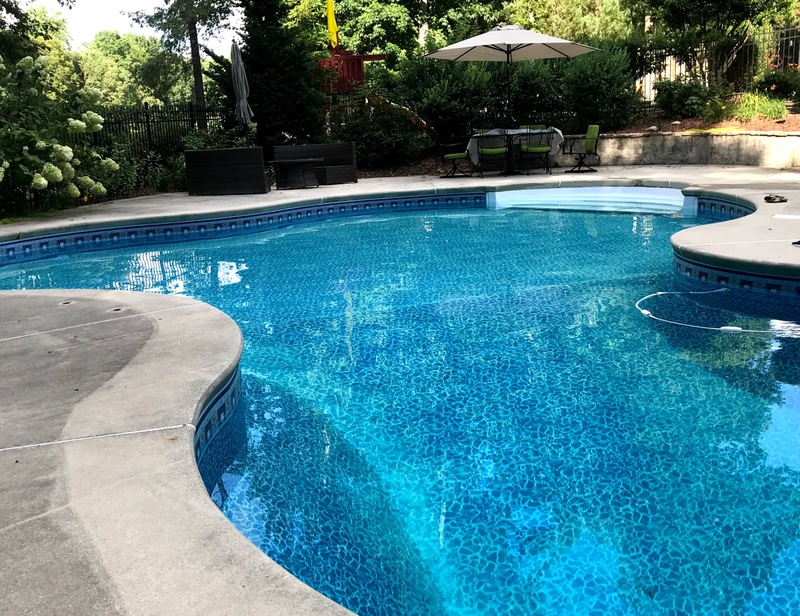 Each spring many of the pool liner companies will select three to five thicker mil liner patterns and order larger quantities of these patterns and then make them available to the consumer at the cheaper 20 mil price. 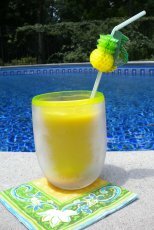 Choose a reputable pool liner manufacturer. You want your liner to be made from virgin vinyl. That means vinyl that has never been recycled or reground. Recycled vinyl does not last as long and the quality isn't as good. Most of our swimming pool liner installers used Loop-Loc or Kafko vinyl swimming pool liners. Another common manufacturers are Total Vinyl Products and Tara Liners. We selected a Loop Loc design called Malta with Sea Blue Bottom. Most companies offer a clear protective coating that protects your liner from sun, chemicals, bacteria, fungus, and algae. Kafko has a product called SuperMax that has been out for 6 years. It is a baked on UV shield that protects vinyl inground swimming pool liners from deteriorating. Most people go with a patterned pool liner with a tile looking border. However, just to let you know, it is possible to make the pool liner in just the pattern without a tile border. All of the pool installers told us to stay away from a solid color as it shows imperfections and stains are more visible. 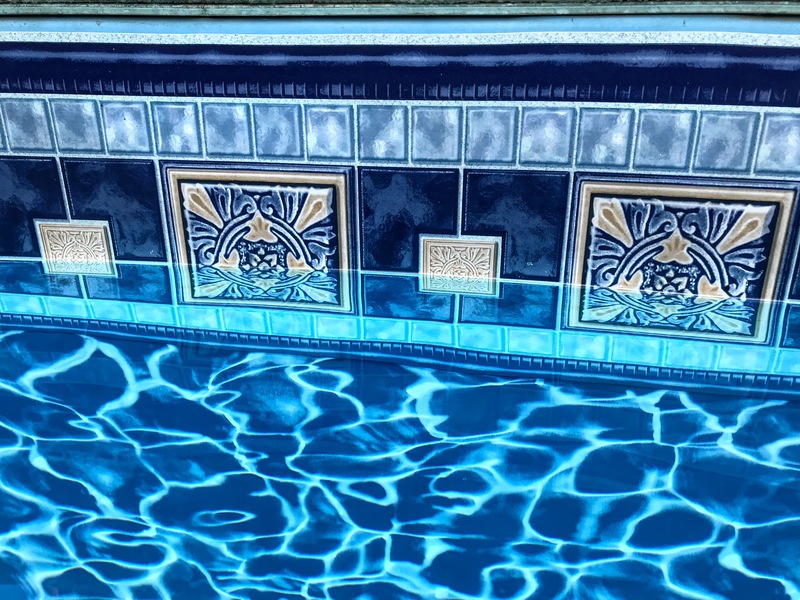 When we first put in our inground swimming pool 15 years ago, we decided to go with a lighter bottom and a darker tile border. The border kept it's color quite well considering all the chemicals and UV light it was exposed to. We also had lots of trees and leaves that stained the pool bottom which required the use of lots of chemicals. We used different stain removers which worked well, but also lightened the bottom liner, so that as the years went by it got lighter and lighter. When we had the pool lights on in the evening, the lighter liner showed all the imperfections of any slightly uneven surface or tiny bumps. Here is a picture of our new dark vinyl swimming pool liner. I had a girl's weekend at my house and of course we spent some time out by the pool. I didn't mention that we had put in a new liner, and all of the guests commented on how much the pool "sparkled." Compared to the light pool liner, we like the darker liner for several reasons. 1. It does add some some "sparkle, life, depth" compared to the lighter liner. 2. It won't show stains and will be easier to maintain. 3. When the pool lights are on in the evening the bottom surface of the pool appears smooth. 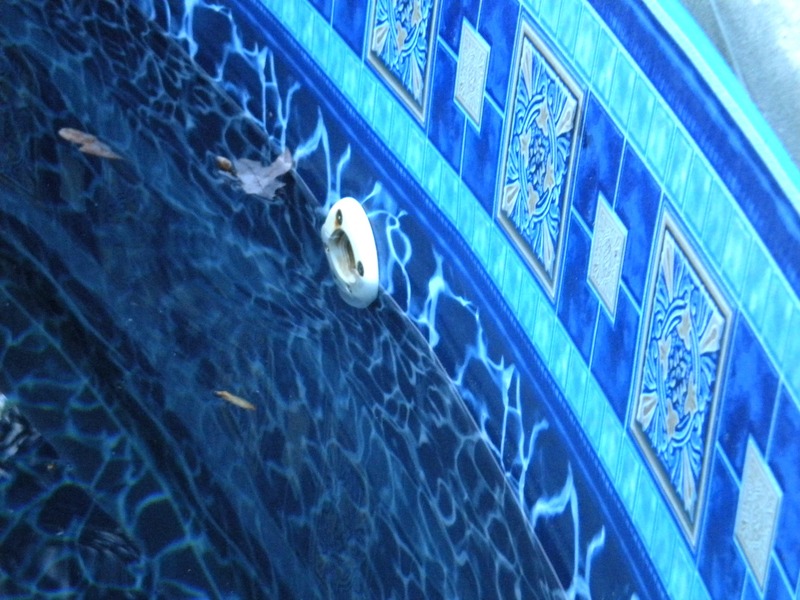 Every indent and uneven surface was very noticeable and I think magnified by the water with the lighter pool liner. Several months after installing our darker, new pool liner, we noticed tiny white specks had developed on the liner on the bottom of the pool. I assumed it was some type of problem we were having with our pool chemicals. The pool installer and the Loop Lok representative came over over only to tell us that, "Oh, yes this is what happens when the pool cleaner is moving over the liner, it rubs against any tiny bump - tiny as a piece of sand and wears off the color of the liner." It's not really noticed on a light liner, but evident on our dark one. 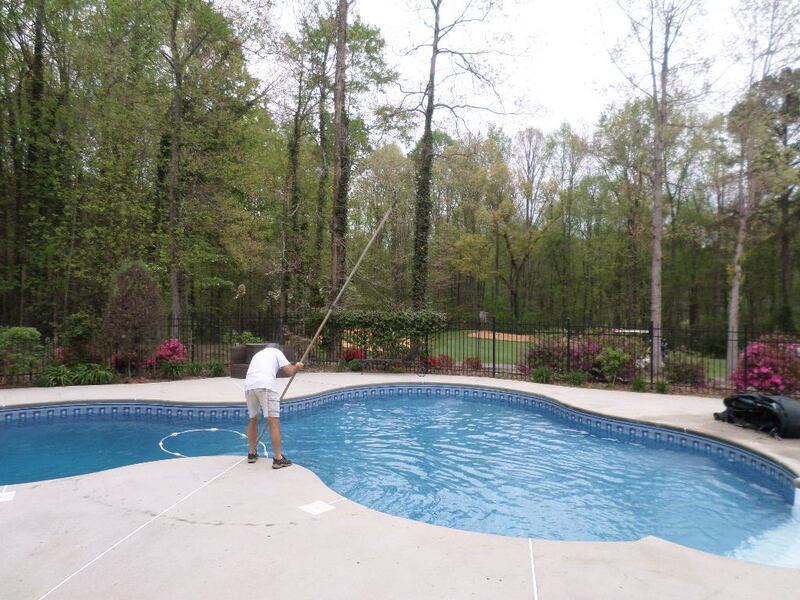 Now we minimize the number of hours the cleaner is on and brush our pool more often and reduce how often our pool cleaner is running. 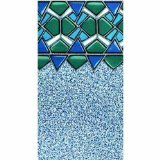 Swimming pool liner borders come in such a great variety of colors and designs. This year we are replacing our inground swimming pool liner, and I am having a hard time deciding which one I want. If you find that your favorite border and favorite liner bottom don't come together, ask your dealer if you can create your own custom liner - of course this costs more. In my opinion, get the widest steps available. Especially since we have lots of small children and families coming to the pool, the steps are a big "hang out" spot. Swimming pool steps for vinyl pools are made out of a molded fiberglass and are available in different models and sizes. Normally they come in just two color options - white or blue. It is possible to cover the steps with the vinyl pool liner. A raised tread pattern offers a slip resistant finish. Choosing pool liners is a decision that you will live with for 7-10 years. 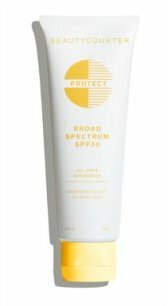 Whether you get a light or dark liner, both eventually fade due to pool chemicals and UV exposure.